Need a great Father’s Day BBQ Recipe? 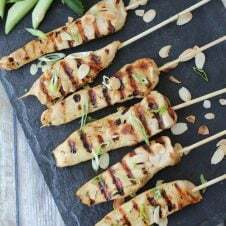 This Gluten Free Beer Can Chicken is packed with Asian flavour thanks to a Chinese Five Spice Rub and an addictive Hoisin Glaze. See, I love you dad. Let’s be honest. Father’s Day has never had the massive excitement that we see with Mother’s Day. Father’s Day is really about two things. Okay, well, three things if you count dad. Father’s Day is about BBQ and Beer. I have written about these two lovely combos before with my amazing grilled panzanella salad recipe (that yes, included beer). I also have a great recipe for beer brussels sprouts slaw that is TOTS dad approved. If you haven’t seen my collab video with my BFF Fidel Gastros, now is definitely a good time. Okay, so what else can I do with BBQ & Beer? Obviously Gluten Free Beer Can Chicken! So traditionally beer can chicken is a borderline trashy dish, but not my version. First of all, I use a gluten free beer to keep it GF for my sister. I then start by adding lemongrass, scallion, and ginger to my beer cans. Then I make a rub of lemongrass, ginger, garlic, and five spice (which is addictive BTW). 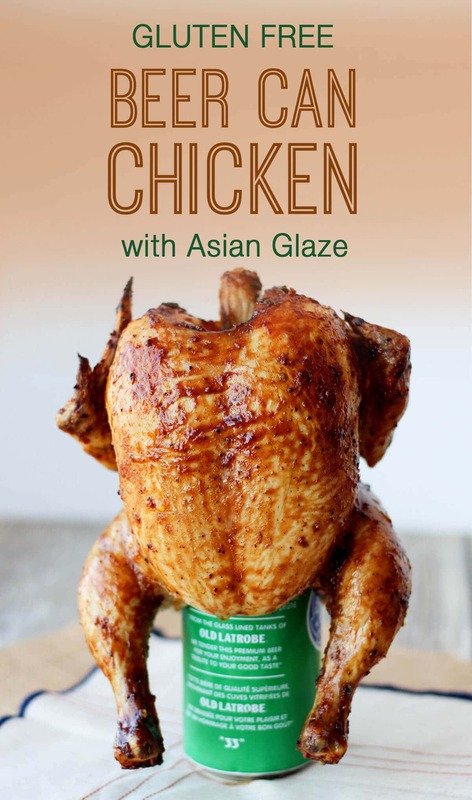 Once I prop my little chicken onto its beer can pedestal, I slather it with a hoisin sauce based glaze. Yes, it feels a bit invasive to shove a beer can up the cavity of your poor unsuspecting chicken, but hey, the results of this Gluten Free Beer Can Chicken will be worth the pervy move. 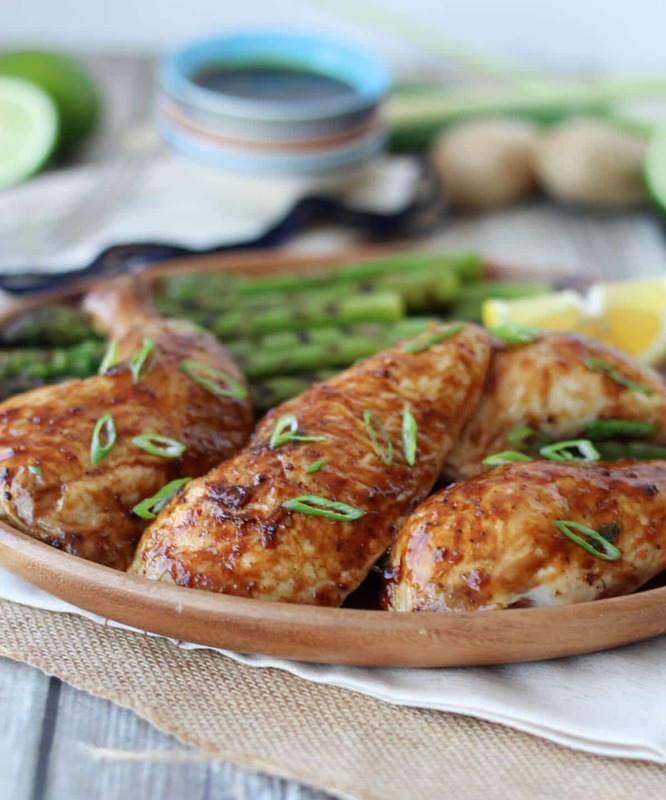 The whole idea of beer can chicken is that the flavour inside the beer helps to aromatize and flavour the chicken, while adding MUCHO moisture to the meat. And since we are also adding ingredients TO the can, it amplifies this flavour even more. See, it’s totally possible to make a gluten free beer can chicken that looks and tastes a hell of a lot more classy than it potentially is. What are you planning to make dad for Father’s Day? 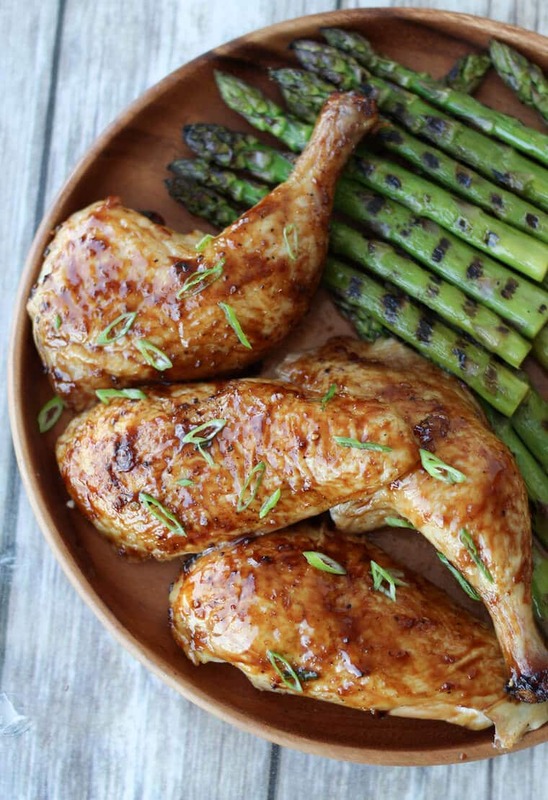 Have you tried making healthy beer can chicken? What flavours would YOU want to put in the can? Preheat your BBQ to medium-high (about 375F). In a small bowl, mix together the rub ingredients. Set aside. In another bowl, mix together the glaze ingredients. Set aside. Drink about half of the beer (yay for drinking while cooking) and insert the lemongrass, scallion and ginger into the can. Place the can on a flat surface. Rub the chicken with the assembled rub and maneuver the chicken cavity over the beer can. I know, it feels wrong, but it will be so right. Place the chicken into the centre of the BBQ grate, balancing the chicken like a tripod on the can and two legs. Cook the chicken on medium-high indirect heat (so the burners should not be directly under the chicken). Cover with a lid and cook for about 1 hour to 1 1/4 hours, or until the breast reaches 165 F, and the thigh reaches an internal temperature of 180 F. Check it by 50 minutes to see if it’s getting close and in the last 15 minutes or so, brush on the BBQ sauce. Remove the chicken from the grill and throw out the beer can. Cover it with aluminum foil for about 10 minutes before carving it up and serving. Disclaimer: This post contains affiliate links, meaning, I may make a small commission if you purchase something. However, all opinions are genuine. I have never tried beer can chicken but it looks great! I need to make this glaze! Pinning! 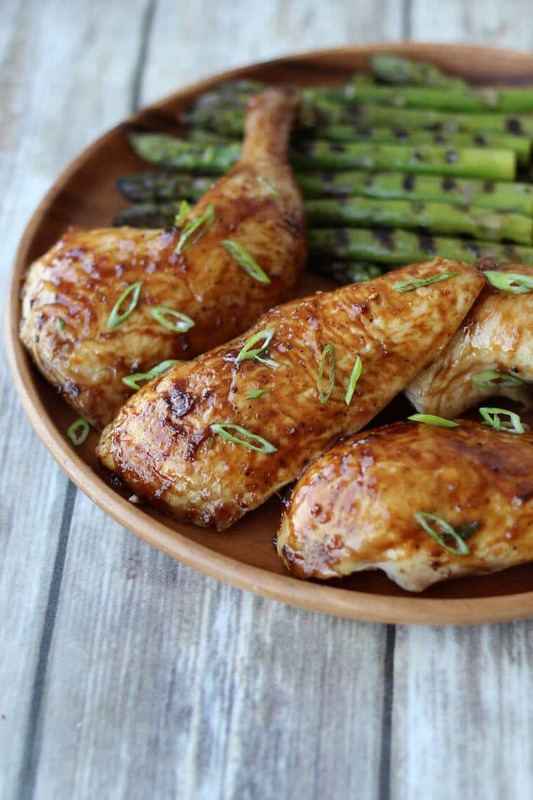 I love beer can chicken and this asian glaze would really take the flavor up a notch.